Yes, I'm comparing a 2015 phone with one from 2018, so it's not a fair fight. 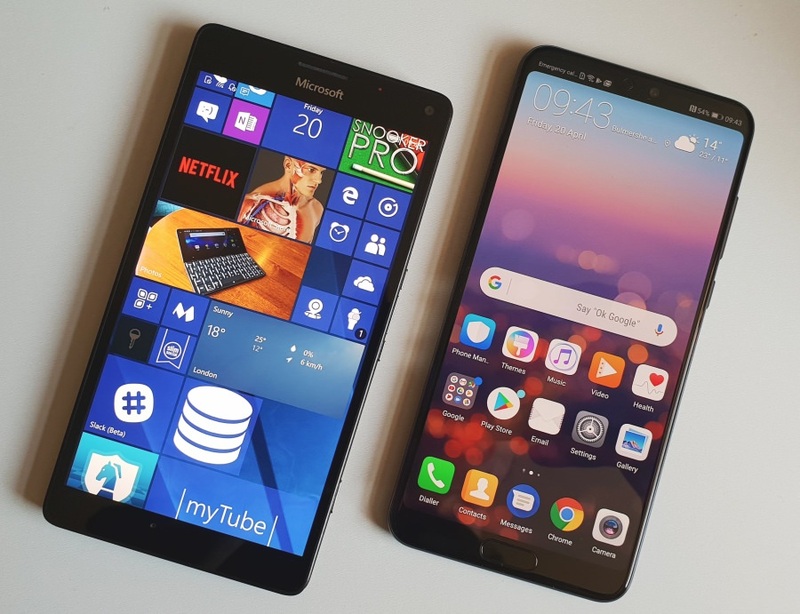 Yet in the interests of showing Windows 10 Mobile users/fans one of the more likely Android phones that they might like to move to in the next 12 months, here's a blow by blow comparison of the ageing but classic Lumia 950 XL against the brand new (40MP-sensored, triple lens) Huawei P20 Pro. And yes, a full-on imaging comparison is next...! Although there's life left in Windows 10 Mobile in terms of updates and support, new hardware is almost non-existent, plus repairs and spares for older hardware are becoming tricky - so it makes sense for everyone to be aware of the best of the rest, flagships from other platforms. And with the Huawei P20 Pro in for review for The Phones Show, it seemed appropriate to put up a direct comparison. Current price, availability No longer officially for sale, though it's often on clearance prices if you're lucky and at outrageous profiteering prices due to rarity (if you're not!) £799 inc VAT, though do shop around, this will drop quite quickly. 155 x 74 x 8mm, glass front and back, melded with aluminium chassis, bezels even smaller on all sides than on the Lumia. Heavier, at 180g. And a huge fingerprint magnet! Durability No specific durability metrics, though the fact that the back comes off will help enormously for water damage, i.e. taking out battery and cards immediately, drying out the internals, and generally taking everything apart. I'm old-school here! Damage to the back or corners is trivial through replacement of the rear, but the screen's exposed, of course. IP67 for liquid and dust, but needs a case 24/7 because of the shatter-prone glass front and back - and hyper-expensive repairs. Operating system, interface Windows 10 Mobile, officially updated to W10 Fall Creators Update (Autumn 2017). Dismissable virtual controls, as needed, for more content on display. Android 8.1, EMUI 8.1, virtual controls on screen almost all the time, though there's the option to use the fingerprint sensor as a navigation control instead, again for more content on display. Glance screen available (in various colours) for always-on time, day and notification icons, plus some detailed info from a specified app. 6.1" AMOLED 1080p screen at 18.7:9 aspect ratio, always on time date and notification icons possible (though off by default), contrast excellent in all light conditions. Connectivity LTE, NFC (all uses), Wi-Fi b/g/n/ac, integral wifi tethering, Bluetooth 4.2 (all uses). Continuum connectivity to use a wide range of first and third party ecosystem-wide UWP apps on external displays as secondary screen, independent of the phone display. Both direct and (charging) 'dock' connections are supported. A narrow win for this, but Continuum is definitely more widely useful than Huawei's version. LTE, NFC (all uses), Wi-Fi b/g/n/ac, integral wifi tethering, Bluetooth 4.2 (all uses), infrared beamer. 'Easy Projection' desktop mode through a direct cable connection, though limited at present to a handful of built-in and vetted applications. Processor, performance Snapdragon 810 chipset with 'liquid cooling', 3GB RAM, faster than it's ever been now on the Fall Creators Update. Multi tasking and app resumption is excellent though, at least with all the modern UWP apps. Kirin 970 with 6GB RAM. Lightning fast at everything, from app launching to resumption, very impressive. Capacity 32GB internal storage, expandable via microSD to extra 256GB, gets the win for this, both for absolute potential storage and data flexibility. 128GB internal storage, no expansion. Triple: 40MP (f/1.8, 1/1.7", Quad Bayer filter) + 20MP B/W (f/1.6) + 8MP (f/2.4, 3x optical zoom, OIS), Leica optics, phase detection and laser autofocus. Software combines input from (typically) at least two of the sensors all the time. Both FABULOUS phone cameras and yes, there's a shootout coming very soon here on AAWP that will include both. Imaging (video) Up to 4K, optically (and optionally digitally) stabilised, with 'Best photo' 8MP grabbing built-in, plus Rich Recording and HAAC microphones for high quality, gig-level stereo capture. Up to 4K video capture, digitally stabilised, audio quality excellent, also in stereo. Haven't tested gig-level audio yet though. Decent mono speaker, loud but lacking in bass and depth, though you can trade volume for fidelity in a simple tweak. Front facing 'stereo' speakers, i.e. earpiece used to push out mid range and high frequencies from the left channel, while the bottom speaker handles bass and right channel. Decent volume, though, overall. Standard 3.5mm headphone jack with decent DAC plus system equaliser, Bluetooth A2DP+AptX, so plenty of options. No headphone jack, though you do get a Type C-to-3.5mm adapter in the box. There's no listening while charging though, and you always have to use the adapter. On the Bluetooth side, this has A2DP+AptX HD. Windows 10 Maps is now pretty mature and impressive, especially once you've learned the live traffic routine trick! Offline maps save a lot of data bandwidth for those on tight contracts or pay-as-you-go, though we haven't had map updates for over a year - sob! Google Maps is now the gold standard in phone navigation, tied in with many other Google services and offering true real time navigation around traffic issues. Maps can be cached and maintained offline as needed. Cortana/Voice Cortana is now mature and well integrated, and with a surprising degree of 'assistance', though it doesn't seem to be improving at the same rate as Google Assistant. Google Assistant is baked in and works well. Battery, life Removable 3300mAh battery, and the ability to change cells gets the win here in my book, the 950 XL easily gets through a day (on latest firmware), plus USB Type C Power Delivery (up to 3A) and Qi wireless charging built-in helps the win. Sealed 4000 mAh battery, easily gets through a day. Proprietary fast charging up to 4.5A at 5V via USB Type C port. Cloud aids Windows Photos syncs across all signed-in devices, subject to your OneDrive tariff (stingy, unless you have Office 365), should you have thousands of images in the system. Plus Windows 10 backs all your media, application data and settings to a separate backup folder system, tariff-free on OneDrive. OneNote, Office, and more all use OneDrive seamlessly. Google Photos, once installed, does a great job of organising photos and syncing them across all signed-in phones and tablets. You lose some quality in the free backup service, but it's not obvious - plus you can pay for full quality uploads if needed. Google Drive and Google office applications work well online. Biometrics Iris recognition ('Windows Hello') works well unless you wear varifocals(! ), but takes at least a second (including an animation!) in real world use, even with the latest OS update. There's also no official way of paying in shops using this, at least not in most of the world. Fingerprint sensor (on the front) works well, and very fast. Works well with Android Pay. There's also a face unlock mode for simply getting into the phone, using the FFC. Applications and ecosystem Windows 10 Mobile now has just about every mainstream app covered. Often third party clients are involved, mind you, there are companies who hate Microsoft so much that they simply refuse to write for Windows, it seems. And 'long tail' niche/boutique apps are hard to find for real world companies and shops. Most things can be done via Edge, though 'not quite' as slickly as with dedicated applications. Maybe the new PWA era will save the day? The might of Google and Android's app ecosystem - everything is available and almost always in first party form. Upgrades and future Windows 10 Mobile will be updated monthly through 2018, of course, as part of the global Windows 10 ecosystem, albeit on the 'feature2' mobile SKU for 'Fall Creators Update'. End of updates is scheduled for Spring 2019, with a possible nominal extension to Autumn 2019. Huawei's update record is patchy, even at the flagship end of the spectrum, and expect a delay of at least up to six months between each Google Android platform release and a Huawei equivalent version being rolled out. Adding up the green 'wins' (for fun?!) gives the two and a half year old Lumia 950 XL 8 to the new P20 Pro's 10. 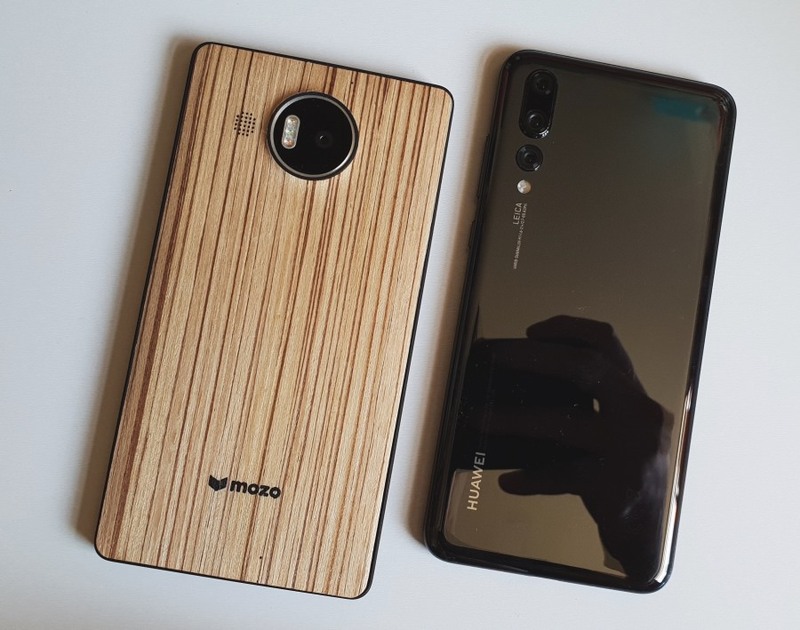 Which may sound odd as a verdict for AAWP, but I'm nothing if not objective when comparing smartphones - if you want a little more subjectivity then see my feature here. Mind you, 10-8 is not that dramatic a win considering the age of the two devices. The usual caveats apply about totally different ecosystems, and going where the services and apps you need live - you could argue that the 'Applications and ecosystem' row should have double or triple weighting, for example! Plus several of my scorings can be argued either way, such as me rating the 950 XL as (theoretically) more durable and (self?) repairable than the P20 Pro, yet without any waterproofing at all, and with a question mark over the availability of Lumia components in 2018. Even though the P20 Pro is more modern in many ways here, what's interesting to me is that the way Huawei has hobbled its own flagship - no expansion, no 3.5mm jack, no Qi charging, screen compromised by the front fingerprint sensor - bring it back significantly in terms of overall desirability. Comments welcome! Does the P20 Pro appeal to you as a jumping off point from Windows 10 Mobile into Android? PS. You won't want to miss my imaging shootout. Which PureView champions shall I pitch this against?